The museum is located on the corner of 3rd Street and Anderson Avenue. 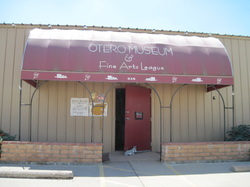 The Otero Museum entrance is located at 3rd and Anderson in La Junta, Colorado. From Highway 50, turn onto Anderson (between Sonic and Carquest) and go two blocks to the entrance.